Feast It make booking street food trucks and pop-up bars for your wedding seriously easy and hassle-free! Have you been to a wedding where the food is served cold? Or soggy? Street food makes that a thing of the past, it’s fantastically fresh (think meat straight from the grill and cocktails garnished with fresh sprigs of herbs) and all of the food our chefs whip up is made to order and totally customisable, meaning any picky guests are easily taken care of. These are not the greasy burger vans that sit on the side of the motorway or the tasteless canapés that you’ve had at so many weddings before… these are gourmet street food trucks, run by spectacular chefs with a real passion for both authentic and innovative flavour. 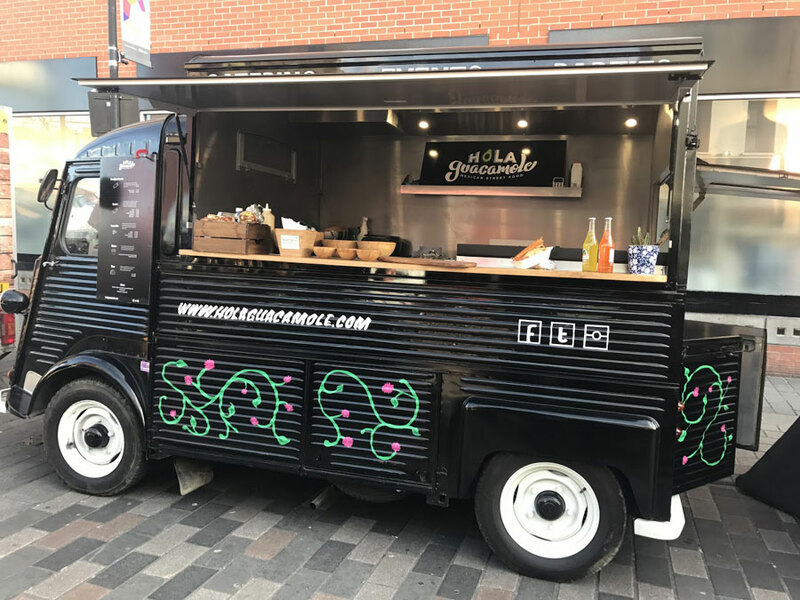 Our trucks and market stalls are really gorgeous to look at, often lit up with fairy lights, retro LED signs, menus written out in calligraphy on old-school chalkboards, or decorated with flower garlands. 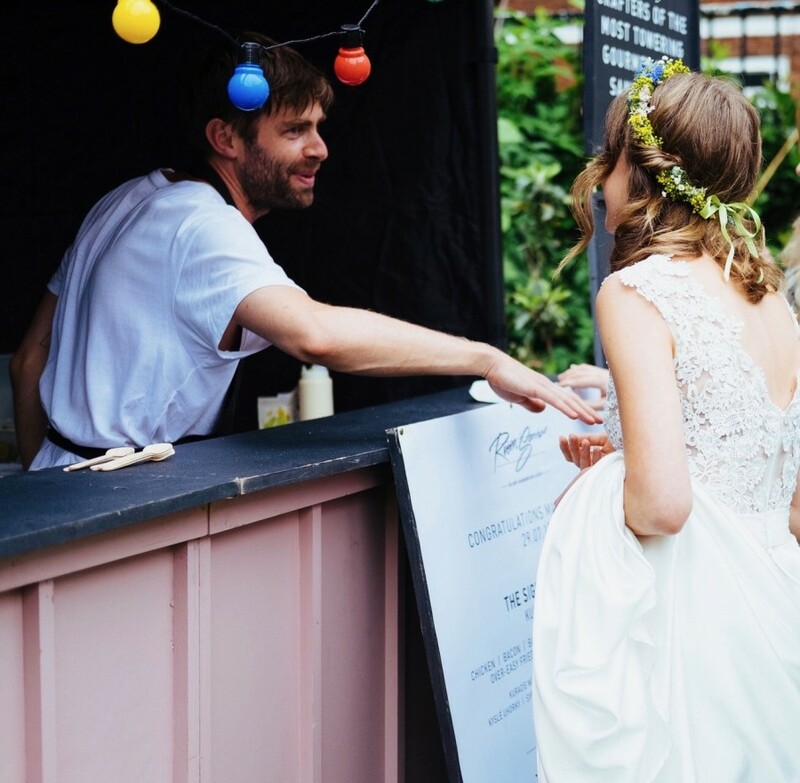 If you want menus tailor-made for your wedding, with ice cream flavours, prosecco cocktails, and cheese toasties named after the Mr & Mrs, served by charismatic and friendly foodies then look no further than a trendy street food trader. 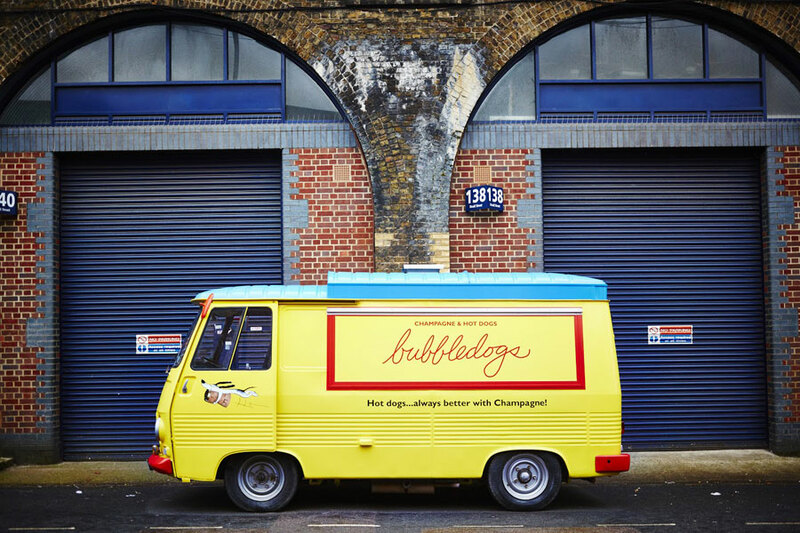 One of the most spectacular looking food trucks on our books, Bubbledogs have taken two of life’s gifts, hot dogs and champagne, and niftily put them together. How wonderfully simple and brilliant! All served from the side of their bright yellow and blue Mystery Machine-esque 1973 van, they specialise in 100% British sausages, handmade and smoked to perfection, nestled in a freshly baked, hand-rolled milk buns. Feast It’s favourite is the Truffle Mac Daddy… a beef, pork, or veggie sausage, topped with macaroni and cheese and rich black truffle, washed down with a crisp glass of fizz! STAKEhaus are all about producing superb quality British meat that really packs a punch in the flavour department, paired with incredible homemade sauces and rustic fries. 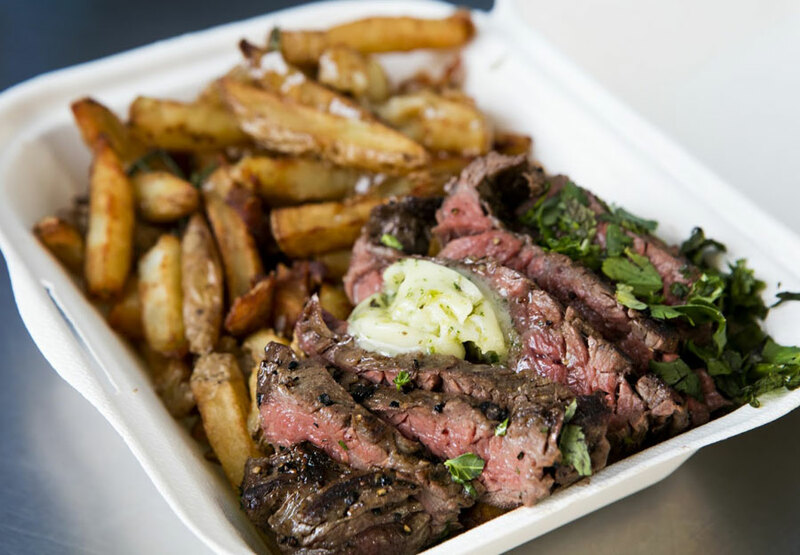 This is unbeatable gourmet steak and chips. Praised by The Evening Standard as one of London’s best traders, these girls provide the ultimate steak experience and would be a deliciously fitting addition to any barn or farm wedding. Their Angus Bavette steak is medium-rare (just as it should be), rich and juicy, served with rosemary French fries and sumptuous sauces. The Steak Sandwich is packed with creamy gorgonzola, fresh pear slices and peppery rocket, and there are also crispy crunchy courgette fries on the mouthwatering menu. Absolutely ideal for an outdoor wedding where guests are going to be milling around and chatting, The Calzone Kitchen serves outrageously tasty folded pizzas, all wrapped up so you can keep gooey cheese and tempting toppings from going down the front of your outfit. 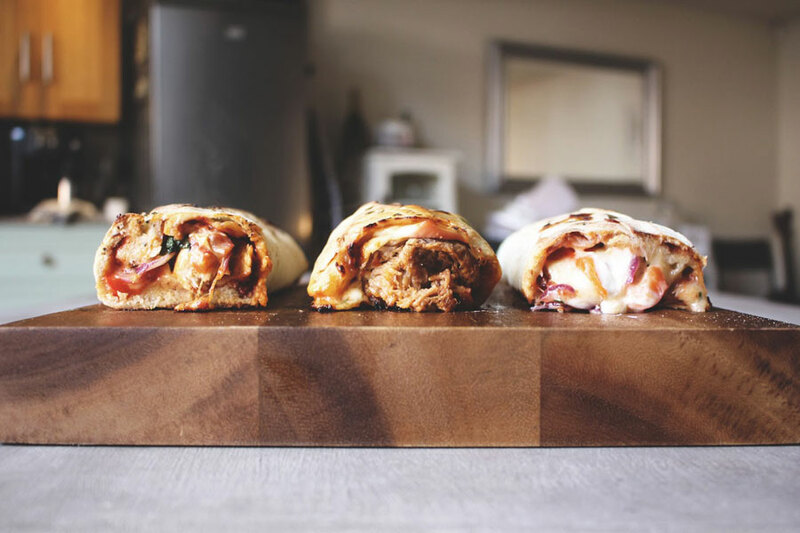 These artisan calzones are heartwarming and delicious, a simple and fantastic wedding feast for your guests, and some of the best we’ve ever tried. These guys can create bespoke menus to specifically suit your celebration, and guarantee excellent service (they are also remarkably friendly and smiley). It was very difficult to choose and we got pretty hungry in the process, but our favourite here at Feast It is The Original St Charles… chorizo, peri peri chicken, red pepper, feta, red onion, fresh fragrant basil and velvety mozzarella. 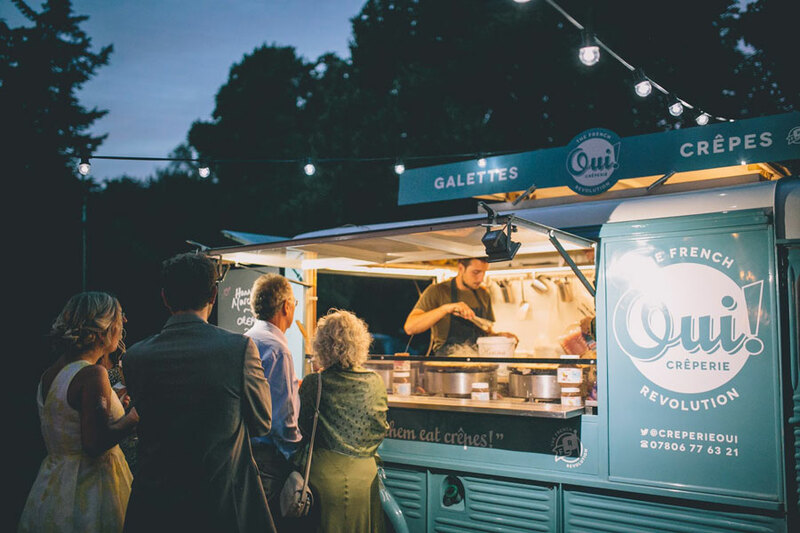 Not only will The French Revolution look marvellous at your wedding with their pale blue vintage van, they will also delight your guests with delicate yet satisfying crepes and galettes, both sweet and savoury, theatrically made inside their van (a subtle wow-factor). Total experts at weddings, they can serve their crepes and galettes in cones, ideal if your guests are going to be standing, or they can be served on your grandmother’s finest china at a sit-down dinner if you so wish – the possibilities are endless. Choose from a classic range of crepes, from banana and Nutella to cinnamon sugar and butter, as well as savoury galettes, topped with cured ham, cheddar, roasted garlic, mushrooms, caramelised onions and many more premium ingredients! The buckwheat galettes are naturally gluten-free and the truck can also cater for vegetarians and vegans. What’s not to love? Magnificent Mexican classics with a contemporary twist, Hola Guacamole use the freshest herbs and vegetables, meat and citrus fruits to make their exquisite menu of burritos, tacos, fajitas, nachos, and quesadillas. Of course, it goes without saying that their guacamole is probably the best you’ll ever taste. Tender chicken, cheesy quesadillas and veggie burritos are whipped up fresh to order inside their vintage Citroen truck. These guys are totally passionate about the food they create and it really shows in the spectacularly fresh tastes and deep flavours. These two lovely lads make some of London’s best pizza using an innovative Chadwick Oven that is revolutionary in the pizza world, invented by Baz’s godfather. Every pizza is made totally from scratch at your wedding, meaning you can be sure that it’s fantastically fresh. Baz & Fred are pizza pros who have been in the trade for over five years, and last year they catered for almost 150 weddings! 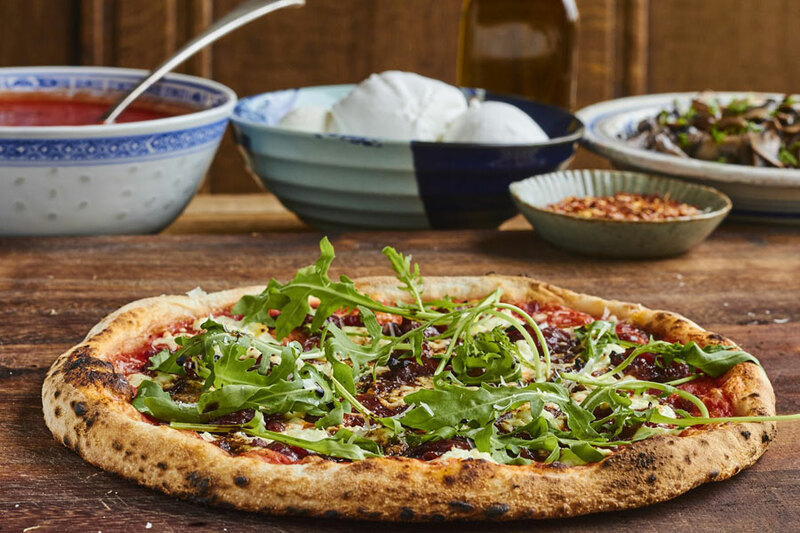 Their menu is classic, yet vibrant, packed with authentic ingredients and their premium cheeses and San Marzano tomatoes are sent directly from Italy. Their dough is made completely in-house and is left to prove for over 48 hours, so it’s seriously fluffy and smokey. The Feast It wedding favourite is the Leek & Pancetta pizza, with hot goats cheese, rocket and fresh basil and oregano. If you can’t wait for your wedding to try a Baz & Fred, or you want to sample one beforehand, you can visit their permanent restaurant at Flat Iron Square. A great choice for winter weddings, Le Rac Shack are experts in melting hot Raclette cheese over potatoes, french fries, Toulouse sausage and cornichons, which come straight from the South of France. With an après-ski vibe and a taste and smell that will take your guests right back to the Alps, Le Rac Shack get their giant wheels of cheese from Annecy, near Lake Geneva. 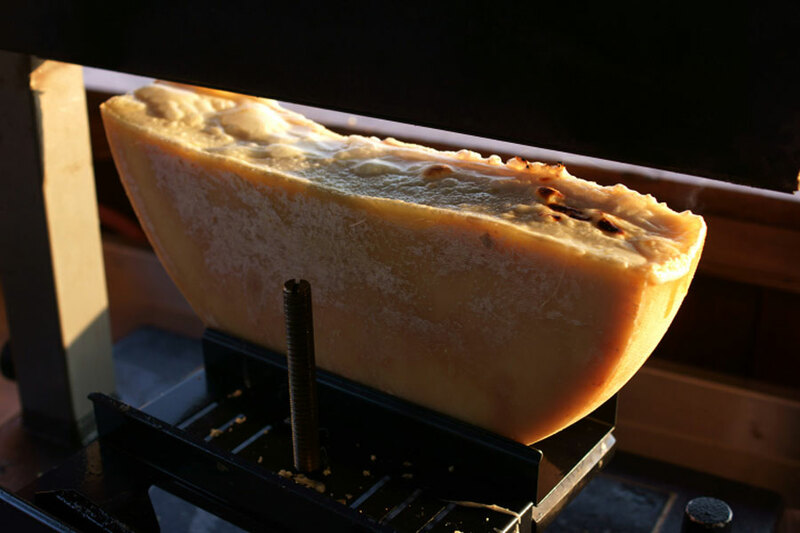 They use traditional Raclette grills to pour the cheese over your dish, as well as scraping off the yummy bubbly crust with a knife. Our fave is the Traditional with sausage, which comes with herby crushed potatoes, pickled cornichons and a rich Toulouse pork sausage, absolutely smothered with hot melty Raclette. This is uplifting food for the soul… cool yet comforting. 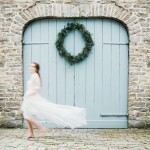 Having a midsummer wedding? The Artisan Strawberry Van was practically made for you! Their magnificent retro van will look breathtaking parked up at your venue. Carly and Joe, the founders of the van, come from generations of fruit sellers, so really know fresh produce when they see it. 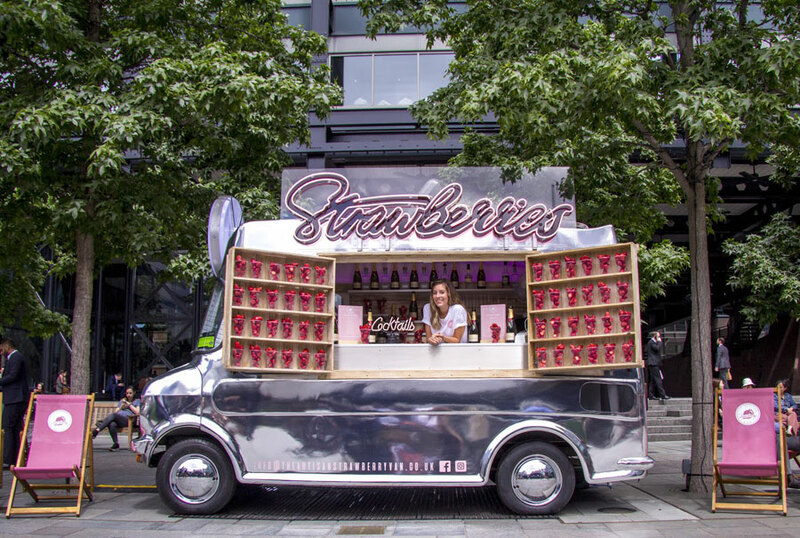 The strawberries are picked up every day from London’s Western International Market and are used to create a variety of strawberry-based cocktails, from daiquiri’s to their Strawberry Gin Smash, and non-alcoholic smoothies made using almond and coconut milk. As well as a classic Eton Mess, you can order strawberries with a range of tempting toppings, including salted caramel, crumbled cookies, honeycomb and hot melted Belgian chocolate. The Artisan Strawberry Van is a really lovely choice for a wedding – elegant and sumptuous with a trendy, summery vibe. 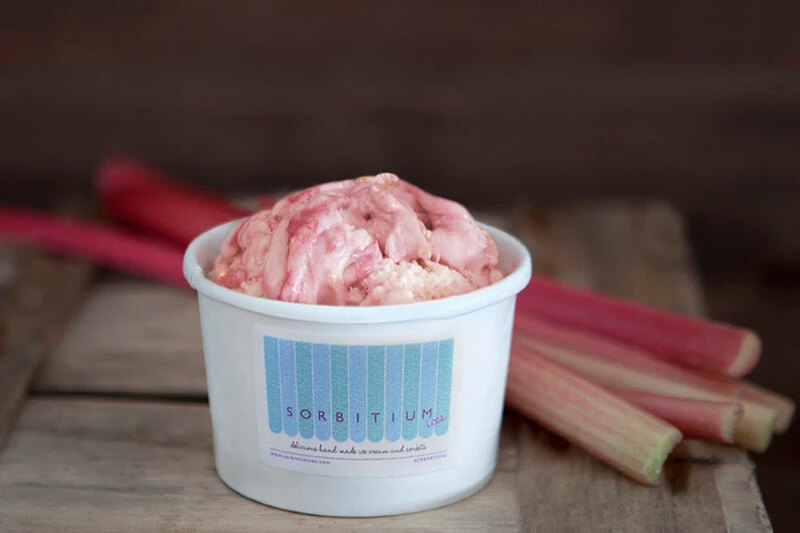 As well as having the cutest mint and cream coloured van, complete with two giant retro Mr Whippy ice cream sculptures on the front, Sorbitium Ices are incredibly innovative despite their vintage appearance. They make natural ice cream, sherberts, granitas and sorbets in a fascinating rainbow of flavours. Their menu changes with the seasons, so if you are having a winter wedding, expect Pomegranate and Blood Orange Sorbet, and Passion Fruit Vanilla Ripple Pavlova ice cream. Those tying the knot in autumn can enjoy Damson and Cobnut Crumble Ice Cream and Quince, Bay Leaf and Verjus Sherbet. Feast Its favourites for spring and summer are the Raspberry and Almond Bakewell and Roasted Banana and Caramelised Cashew. These are just a few examples of their intoxicating ice creams, the menus are enormous! Indulgent, delicious, and totally naughty, Bad Brownie have taken the dessert world by storm with their little squares of chocolatey goodness (you really can’t fathom how good they are until you take your first bite…) The arrival of their gazebo at your wedding is guaranteed to put a smile on everyone’s face and have guests returning for seconds and thirds. Their Triple Chocolate Brownie is brimming with chunks of white and milk chocolate and topped off with a decadent drizzle of all three types. 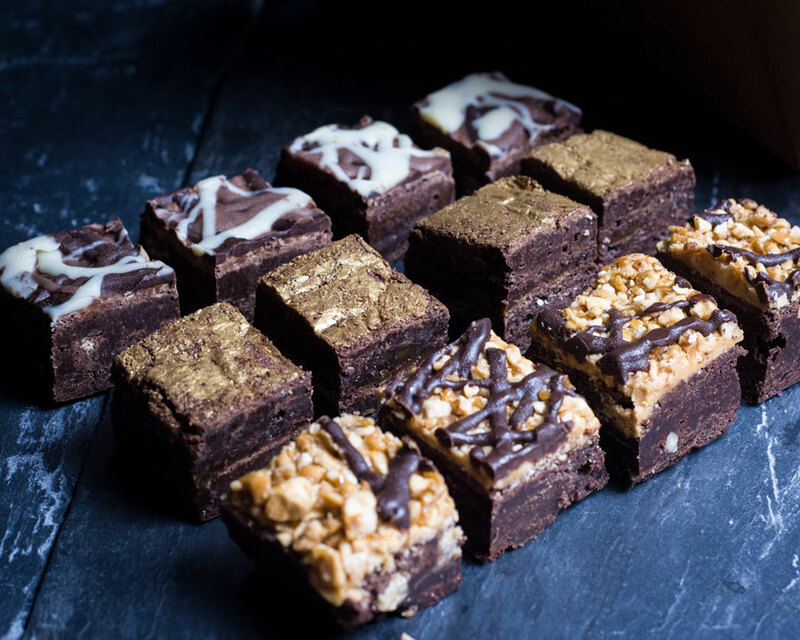 For a real sugar hit, try the Peanut Butter Brownie, filled with crunchy peanuts, smothered with smooth peanut butter and finished with a peanut butter brittle, and the Salted Caramel Brownie is almost unexplainable, with a layer of oozing salted caramel sauce holding together two moist fudge brownies. Treat yourself, it’s your wedding day! So there you have it, Feast It’s best suggestions for wedding street food eats! Don’t forget there are hundreds more traders on our website for you to browse through, as well as a whole host of cool and elegant mobile bars, so you can rest assured knowing that your guests will enjoy delicious food and drink whilst they celebrate your special day. 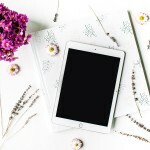 It’s really easy to enquire online, and after you do, one of our lovely team will be in touch to talk through your choices and make sure that everything is perfect. Some really good tips here. Thank you very much!